I love free stuff, don't we all? When that free stuff is also absolutely delicious then it's definitely something that seriously floats my boat. One of my favourite things about Spring is the appearance and smell of wild garlic around the woods. You will probably smell it before you see the little white flowers and pointy green leaves. Wild garlic likes damp woodland, preferable nestled at the feet of deciduous trees and quite often wherever you find wild bluebells growing. Once you have found your little patch of garlicky leaves and harvested a bag full or so what are you going to do with them? Well, first off you want to put them in a colander and give them a good wash. You can cook them like spinach - just wilted in a bit of butter and seasoned with salt and pepper for a really nice garlicky side dish. I really like to make pesto. Just throw everything in a processor and blitz. Stir it through pasta, use it to stuff a rolled pork or lamb joint or drizzle over fish. 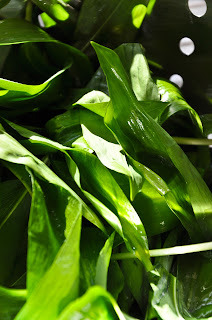 If you like steamed fish try wrapping your fillet in a few leaves of wild garlic before putting it in your steamer for a subtle garlic infusion. 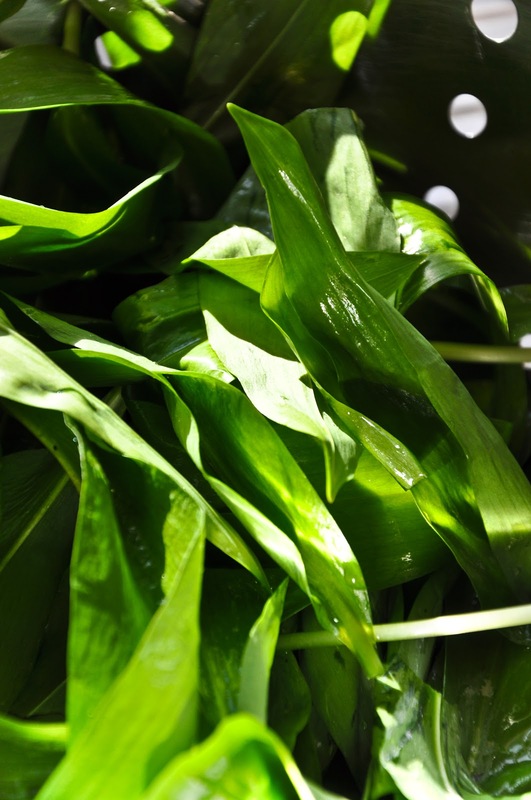 If you are baking bread or savoury muffins or making prawn wontons then chopped wild garlic into your mix will add colour and flavour. 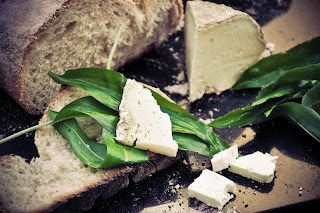 My all time favourite way to enjoy it though is also the simplest: a wild garlic and cheese sandwich on some really good bread with a scrape of mayo - heaven! Ooh I need to start foraging. At my old house there was this weird "weed" growing. I had no idea and neither did my keen gardening neighbour. I eventually found a place online where you can "describe" the leaves using various questions and it turned out to be something called "garlic mustard" which is apparently edible!